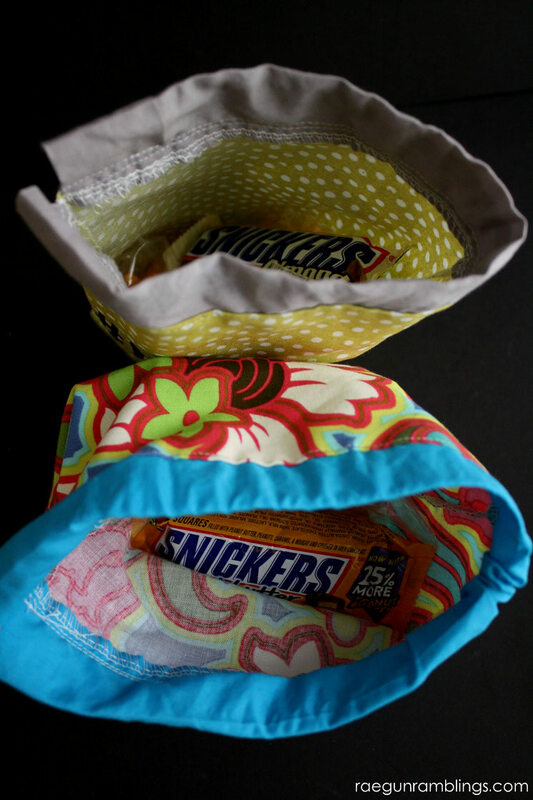 I’m all about the emergency snacks and these easy snack bags I’m sharing today are perfect because I just pack them in advance and hang them in the kitchen so when I’m running out the door I don’t have to stop and think about packing something for me and the baby just in case our errands take longer than I expect. 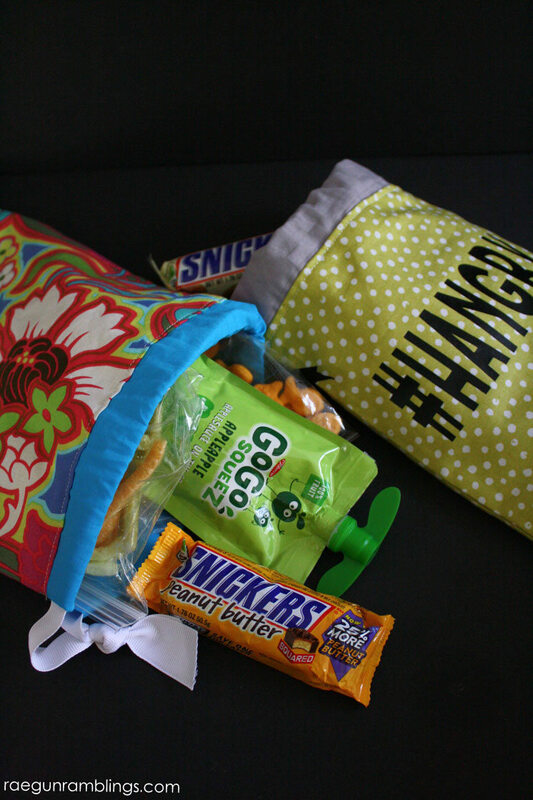 I just grab a snack bag and we’re good to go. 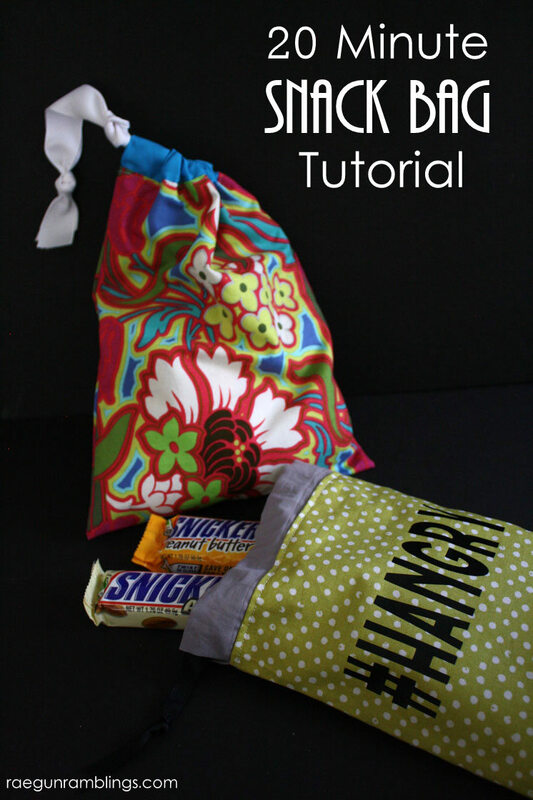 Fold your bag fabric right sides together so you have an 8 X 10 rectangle. Sew or serge down both long sides. Turn right side out. Iron the band fabric in half width wise so it’s even skinnier. 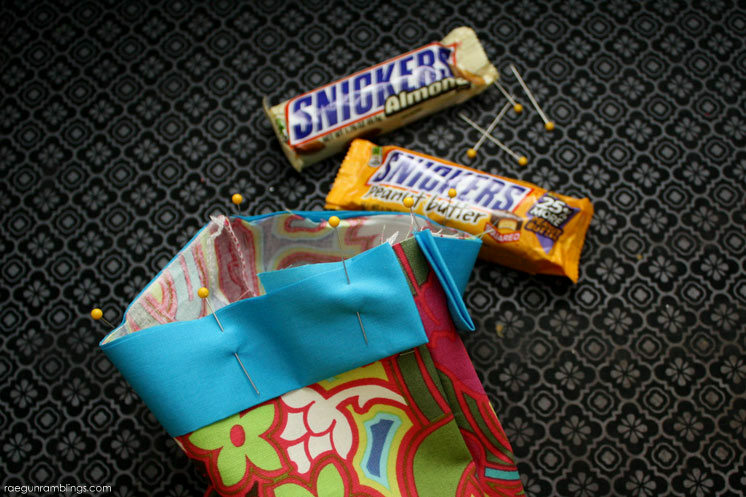 Then fold it in half lengthwise and align it over the bag piece. With the raw edges (not the folded edge) touching the raw edge of the bag tuck the end of the band under and pin to the outside edge of the bag as shown above. 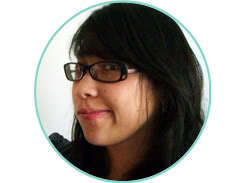 You should have the band pinned all the way around with the two ends tucked under so it looks pretty. Next sew around the top catching both the bag and all the layers of the band fabric. Flip the band up and top stitch along the bag edge making sure to catch the band fabric on the inside to secure it down. 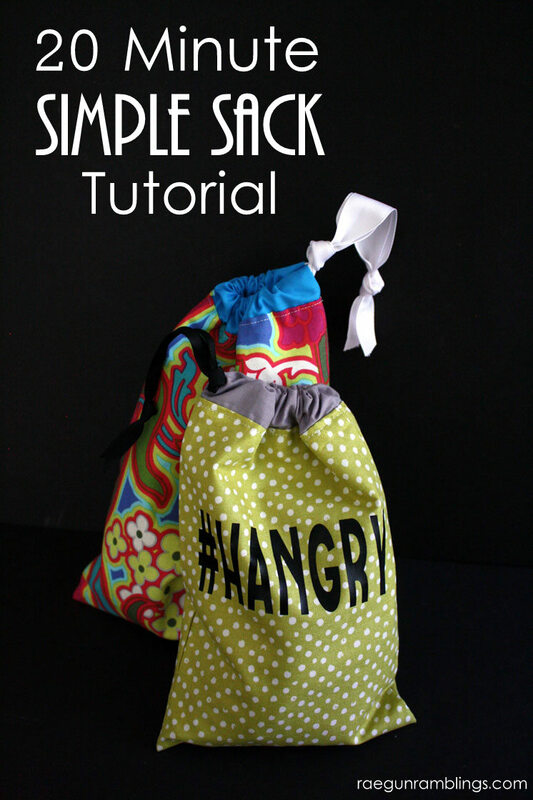 If you want to add some vinyl letters like my #HANGRY do so now. I used my Cricut explore to cut out iron-on vinyl. If you’ve never done that it’s really fun and easy. I have a whole post that will walk you through how to use iron-on vinyl. Finally thread your ribbon through the casing using a safety pin to help push the ribbon through, tie a knot and you’re good to go! 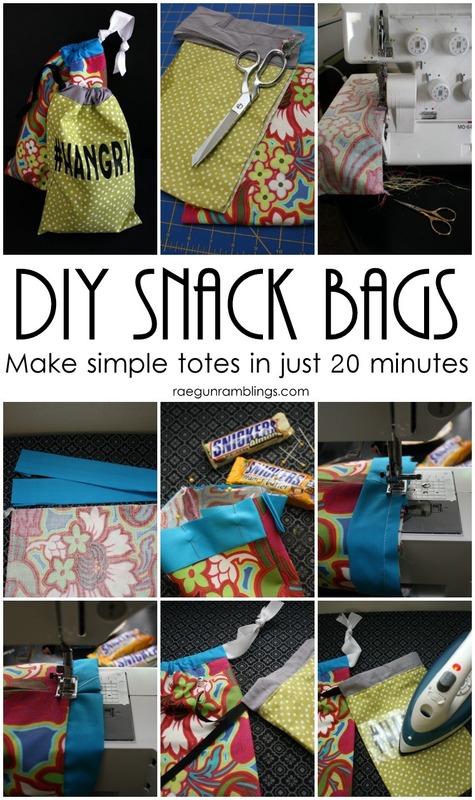 Now all you have to do is fill your bag with treats and you are good any time hunger strikes. 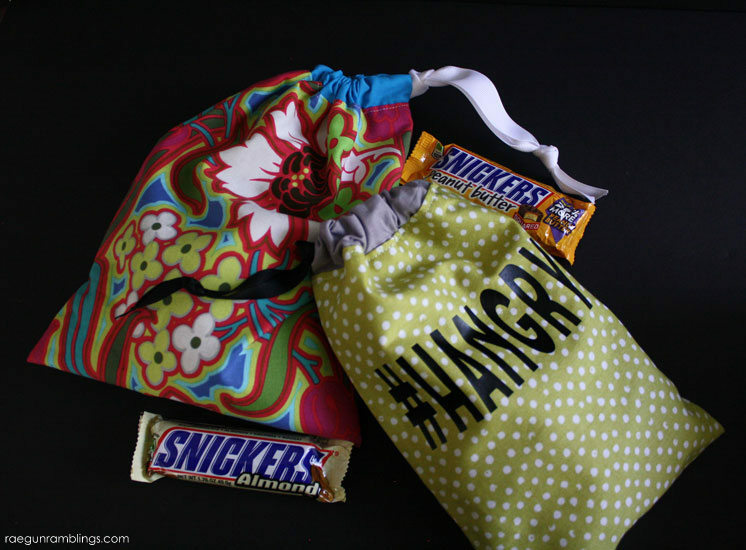 While you are preparing to combat the hunger craze be sure to enter the SNICKERS® “Who are you when you’re hungry?” contest by uploading a personal photo or video from your Computer, Facebook, Instagram or use the SNICKERS® Meme Generator to create something new! Voting begins at Noon on 5/11/15 and ends at 11:59:59AM ET on 7/15/15. 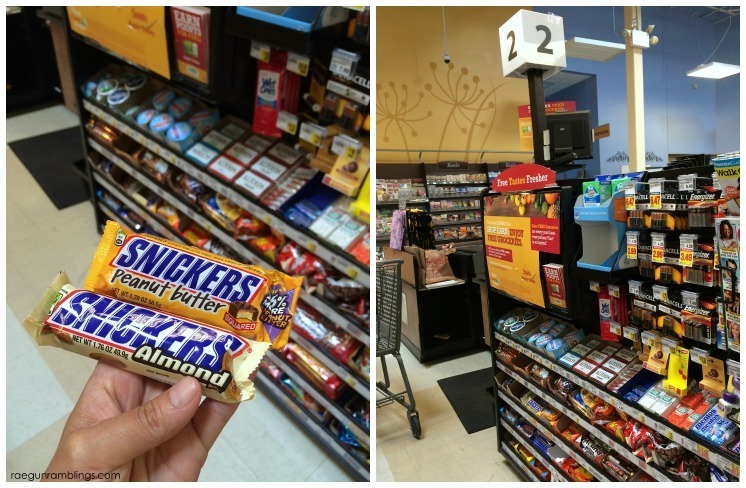 I’m super excited about the SNICKERS® Peanut Butter and Almond that I found in the Kroger check out line. They were on sale so I stocked up :) What are some of your favorite snacks to have on the go? LOVE THESE!! How fun are you. I might just need one in my life. Now! And where have I been? I had no idea that there was a peanut butter Snickers. Must have! Oh my gosh, I love these. They would be perfect for my son to take a snack to karate with him each week. What perfect timing. My son wants goodie bags at this wedding and we can make these very elegant.